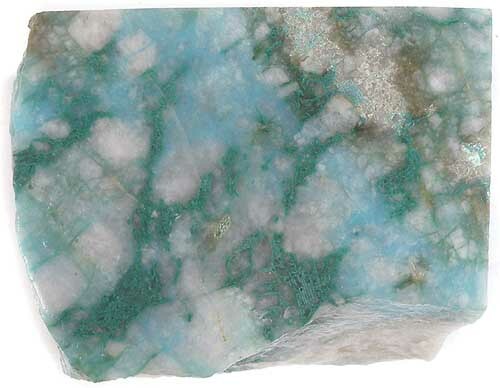 Chrysocolla in Quartz, or Gem Silica, is the rarest and most desirable form of Chrysocolla. This material cuts and polishes like a charm and has fine translucence. It contains other copper secondaries, such as malachite and cuprite, which makes for stunning gemstones. 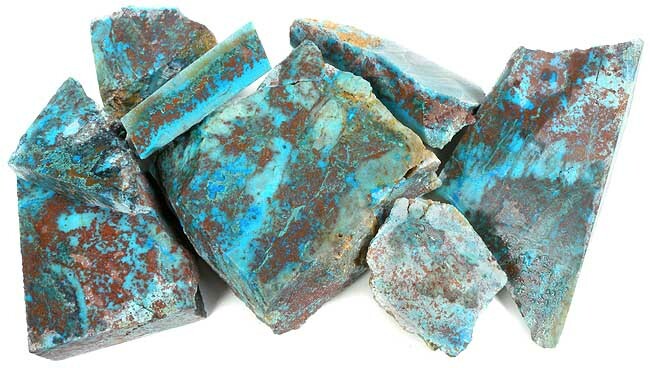 Chrysocolla is a secondary copper mineral with a blue-green color, that some people mistake for turquoise. The main difference is turquoise contains phosphorus and chrysocolla does not. Chrysocolla in Quartz (Gem Silica) takes a good polish with tin oxide or diamond, followed with green rouge (Zam is a brand name for green rouge). Mohs hardness 5.0 to 6.0. This gorgeous material came from an old collection that we high-graded at least 20 years ago! It's been stashed away in our "archives" since then. This Gem Chyrsocolla has a nice mix of chrysocolla, and malachite in a translucent quartz base. This one-of-a-kind material cuts fabulous stones! This Chrysocolla in Quartz (Gem Silica) comes from Globe, Arizona. Globe is the locality of the famed, and now closed, Sleeping Beauty turquoise mine. This Chrysocolla in Quartz will cut fabulous gems! Triangular shape measures approximately 2" x 1-1/4" x 5/8" thick. Measures approximately 2-3/8" x 1-5/8 to 1-1/4" x 1/2 to 7/32" thick. Triangular shape measures approximately 2" x 2" x 7/8 to 3/4" thick. Measures approximately 2-3/8" x 2-1/4 to 1-1/4" x 3/4 to 3/8" thick. Triangular shape measures approximately 1-3/4" x 1-1/4" x 3/8" thick.